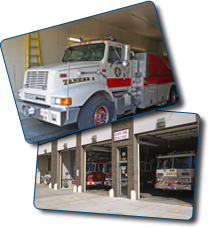 For over 125 years, the Dover Fire Department has been assiduously protecting the residents of Dover and surrounding areas. Teaming diligent training with cutting-edge safety technology, the Dover Fire Department and Emergency Medical Service are the primary respondents to all emergency situations within the city. The departments also have a working agreement with other communities in the area to assist in emergency situations. Members of the fire department and medical service also work closely with local school districts to educate youth about safety in emergency situations. Below, we have provided a link to the United State Fire Administration for Kids. The site is designed to be a fun way to teach your children the importance of fire safety. If you have questions about child safety education or would like to set up an educational session for your church, school or organization, please call the non-emergency number provided below.